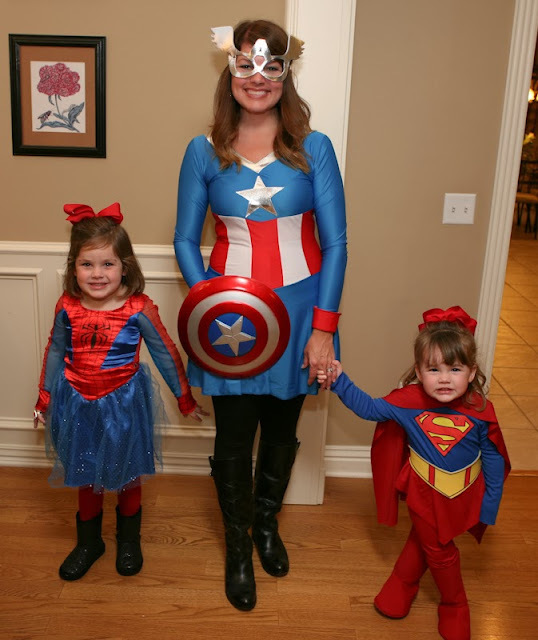 Kelly's Korner: It's a Bird, It's a Plane, no it's SUPER GIRL! It's a Bird, It's a Plane, no it's SUPER GIRL! Hollis is going home with my parents tomorrow for a week so she won't be here for Halloween. I am a little crazy about Family themes for costumes. Are y'all surprised? I love matching clothes. Of course I love family themes. I realize this won't work forever but as long as I can - we will roll with it. 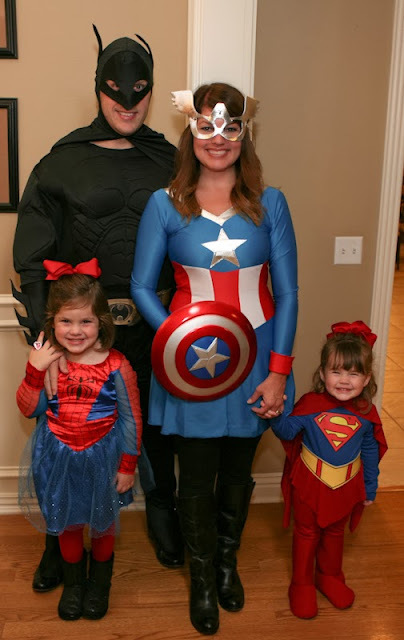 My girls LOVE super heroes so I started planning back in the spring/summer. I collected costumes when I could find them. Chick-fil-a was having Costume Night tonight so we decided to dress up so we could do something with Hollis. Scott is a great sport. I beg him a lot and he really loves his girls. The batman suit was a little snug and it TERRIFIED Hollis - like she was running from him screaming. So he didn't wear the costume to eat. But he said he would wear it Thursday night when we take Harper out. My friend Kacy told us to come by so we could at least trick or treat one house so we did and my girls were THRILLED! 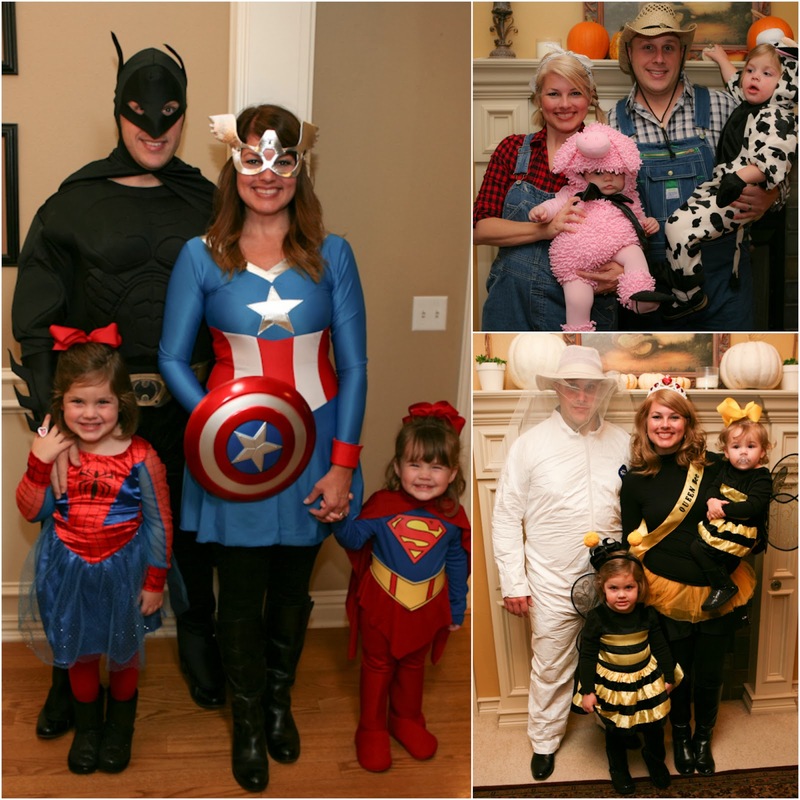 I don't know which year I have liked best - Farm Family, Bee Family or Super Heros. I'm already trying to think about what we can be next year! We will still get to have fun on Thursday! We are ready to save the world!